Designed for a one term introduction to the modern theory of evolution by natural selection and how that theory explains animal social behavior in general and human sociocultural evolution in particular. 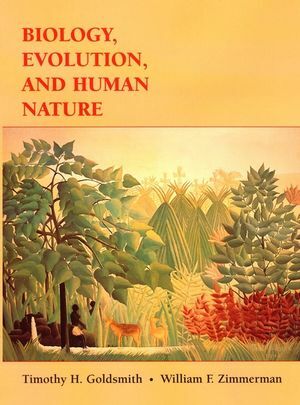 The book can be used in courses in Biology, Anthropology, Psychology, and Sociology, as well as in courses in Economics and Law that seek to include a biological evolutionary perspective. The book is based upon the teaching experiences of two general biologists who have taught these subjects to students at Amherst College and Yale University for many years. It provides a balanced and engaging account of the important theories and concepts of evolution and how they contribute to our understanding of human behavior and history. Timothy H. Goldsmith and William F. Zimmerman are the authors of Biology, Evolution, and Human Nature, published by Wiley. Charles Darwin and the Origins of Evolutionary Theory. Cells and the Molecules of Life. Genetic Continuity and Change: Organisms, Environments, and Microevolution. After Darwin: Molecular Evolution, Selection, and Adaptation. The Success of Social Insects. Parasites, Hosts, and the Evolutionary Warfare of Infectious Disease. Individual Organisms are the Product of Development. The Physical Record of Human Origins. Viewing Human Cultures in an Evolutionary Context. Uses evolution as the unifying theme to trace the connections between levels of biological complexity from genes through nervous systems, animal societies, and human cultures. Examines the history of evolutionary theory from Darwin to the present, including the impact of molecular biology and the emergence of evolutionary social theory. Includes recent work on primate societies and human evolution. Shows how the biological and social sciences provide complementary insights into human nature and history.